And so it is that I embark on another trek this year. This time the plan was Jordan and Egypt. Along the way I spent a day long stop over in Frankfurt, Germany (not so much to say about Frankfort.... bratwurst, tepid beer, scenic squares, art galleries, angry youth, and people wearing funny shoes). Arriving in Amman, Jordan at 3 am would make the visitor think this city is deserted. As I emerged from the local bus in the wee hours of the morning I felt excited and set forth with my trusty backpack. The streets are dark and empty at night. I walked past the occasional all night coffee shop frequented by those incorrigible creatures of habit who appear to have nothing better to do than imbibe strong concoctions of caffeine while others sleep. There was actually something oddly familiar about the pervasive aroma of freshly baking pita bread, Arab spices, and the distinctive scent of coffee in the air. I don't know, maybe it reminded me of the time I spent in East Jerusalem a few years ago or maybe it reminded me visiting my fathers Arabic friends when I was a kid. As with most Middle Eastern countries one cant help realize you are in a far away land when the exotic 4 am call to prayer emanates from the plethora of minarets that seemingly burgeon into the night sky around every corner. Wonder around long enough in any big city and you are bound to encounter a seedy hostel, and so I woke up the proprietor and with a cheery "salem alekum" and 2 Jordanian dinars later I checked in, another adventure begins in the morning. 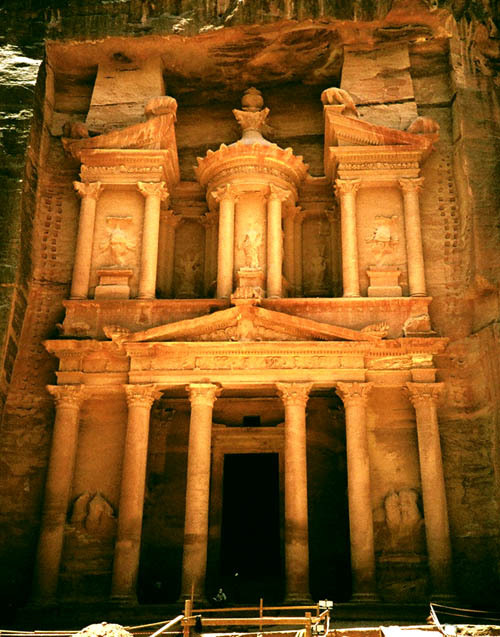 The Hashemite Kingdom of Jordan as its officially called has been a crossroads of culture, occupied at various times by the Assyrians, Babylonians, Greeks, Romans,Hittites and Crusaders. At the turn of the century it was part of the Ottoman empire. After World War One the Ottomans lost most of their empire and for a while the Brits gained what is now Jordan. Fervent Arab nationalism eventually caught hold of the region and the Brits ceded what was called "Transjordan" to King Abdullah in 1948.
me anyway. Amman has quite a bit to offer from ancient Roman amphitheaters to aging citadel forts located atop steep hills overlooking the city. 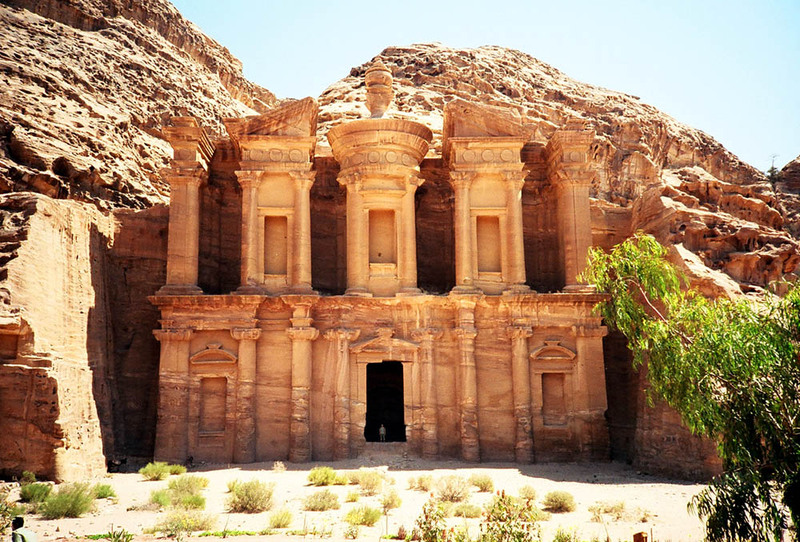 More than anything else Jordan is known for the Ruins of Petra, the red rose sandstone city carved into precipitous cliffs in the middle of the Jordanian desert. The narrow valley known as El Siq is one of the few paths to isolated cliff city. This narrow valley was formed millions of years ago by a crack in a towering mountain, the walls 2 meters apart and 200 meters high. As I ambled my way through the dark inners of the path I had no idea of the spectacle that awaited me at the end. After a mile or so the great chasm spills into a grand geological courtyard of sorts. It is here that the light at the end of the tunnel emerges. Through the adjacent rocks I could see the glowing sliver of a brilliant facade of sparkling red rose that the so-called "treasury building" is carved into. The luminance of the red rose sandstone facade is undeniably spectacular. The building was carved many centuries ago into the sheer cliff. The great portal of the treasury dwarfs the visitor who stands in the 30-foot high doorway. Walk further along the city one passes local Bedouins offering rides on their camels and mules. Similarly impressive buildings and soaring mausoleums line the cliffs of the valley. Later after trekking straight up to the top of another mountain for an hour and a half I came to the serene monastery, equally gigantic, one can hardly believe the handy work of earlier civilizations. It is perched from here that I am reminded of why I like to travel so much. What greater reward does life have to offer than the aesthetic pleasure of staring pensively across an endless desert dotted with looming mountains, as far as the eye can see the sky a deep blue and further than the eye can discern it fades into a heavy violet haze. Peering back I gawked at the parallel tire tracks left indelible crushed into the malleable sand as they disappeared far into the burning horizon and seemingly converged at some finite point. Perhaps if the 1970 jeep were to break down in the acrid sun I'm sure I could find my way back along the tracks....well maybe eventually. 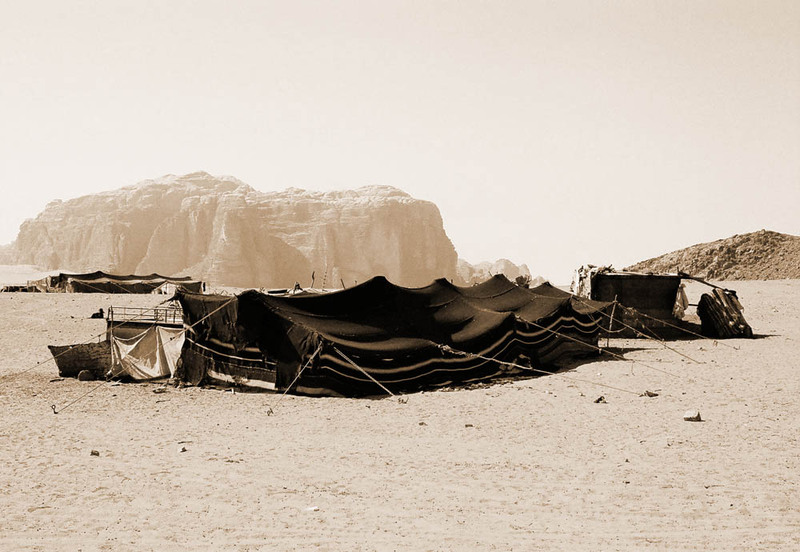 Another of the otherworldly jewels of Southern Jordan, the boundless desert of Wadi Rum stretches endlessly. To drive a day through the untrammeled vastness of the desert is to marvel at man's diminutive status in the grand tapestry of earth. No roads here, just an endless plain of sand and resplendent rock formations haphazardly strewn across the desert like an elaborate game of terrestrial jacks. Furthermore, no signs just north, south, east, west and divers permutations thereof. A land so expansive, I though to myself how did Lawrence of Arabia end up at a watering hole here prior to his conquest in North Africa? ( ......how did I end up here for that matter I guess). it almost hurts the ear.